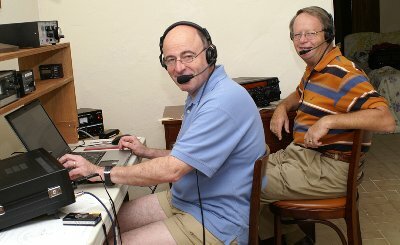 This was a joint FCG (W3TB), FRC (K3YD) contest DXpedition at the QTH of Ed Kelly, VP9GE. Antennas: Cushcraft A-4S, 40 meter dipole, double size G5RV and 160 meter inverted-L.
those Q’s came in a Friday evening opening around 0130Z into zones 4 and 5; most of those 10M signals were as solid as those on a local FM repeater. tuner. Because this was our first joint contest DXpedition we opted to keep the packing simple and light with one radio and one laptop. Being only 700 miles east of the US meant that signal from the States, Canada and Mexico tended to be LOUD! Regardless of the direction of our beam, they pounded in. If we went below the US phone bands looking for EU, the VE’s still pounded in off the side of the beam. When we “played to our strength” by turning the Yagi west, we had great rates on 20 and 15! kept us off 80 and 160 on Friday evening. On Saturday, we managed a repair (NOTE: Always, always take a Leatherman tool in your check bag!) and managed 450+ Q’s on the low bands Saturday night. Our apologies to those we missed Friday. my next trip, though. By the time I got home Monday night, I think both of my arms were stretched an inch longer! in getting our Bermuda operating permit and with showing us around Bermuda. We can’t wait to return.